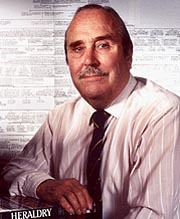 Peter Stainforth was born in 1921 and educated at Tonbridge School and Queens' College Cambridge, where he obtained a wartime degree in Mechanical Sciences. During World War II he fought as a Royal Engineer paratrooper in Tunisia, Sicily, Italy and Arnhem where, wounded for the second time, he became a prisoner of war. As an unofficial War Artist, he had the distinction of having one of his pictures, Flak and Silk, hung in the Chief of Staff's Room at the Cabinet Offices. His best-selling book of his war experiences, Wings of the Wind, first published in 1952, ran to three reprints. In 1948 he married June Spink and, after the birth of their twin sons, John and Gordon, in 1949, they moved to Knebworth in Hertfordshire. For thirty years, from 1948, Peter worked as a Research and Development Engineer with the Plastics Division of ICI, developing man-made fibres and designing full-scale pvc factories in South Africa and Argentina. June died tragically from cancer in 1966, and in 1970 Peter married Dorothy Snoxell, a BBC TV Production Assistant. Peter's main leisure activities included gardening, politics, history and the legend of King Arthur. His extensive research into his own family's history received recognition by a Grant of Arms in 1987. Peter Stainforth died peacefully at the age of 96 on 13th December, 2017.